In the years 1910-1912, Maurice Schwartz (?-?) was an internationally popular Pathé comedian, known as Little Moritz. He came from the German music-hall and worked for Pathé, where Roméo Bosetti and others directed some 30 short and silent comedies with him. Sarah Duhamel was sometimes his partner as 'Rosalie'. 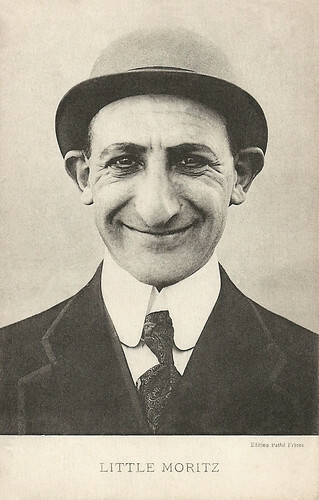 IMDb and Wikipedia apparently mix-up Maurice - Little Moritz - Schwartz with Yiddish actor Maurice Schwartz, who moved from the Ukraine to the U.S. in 1902 and founded the Yiddish Art Theatre in New York in 1926. He made his first film in 1924. Richard M. Roberts at SilentComedyMafia.com: "Little Moritz is, in fact, another Maurice/Moritz Schwartz, apparently born in Germany rather than the Ukraine like the Yiddish actor. Believe little the imd(um)b tells you, they have these two different people combined, the fact that they do not look anything like each other you think would be a tip off." Maurice - Little Moritz - Schwartz came from the German music-hall. In 1910, he started to work for Pathé Frères's Comica studio in Nice. There he worked with director Roméo Bosetti, who directed him in short silent comedies. Fondation Seydoux-Pathé lists 30 titles with Schwartz between November 1910 and December 1912. All his films are short and silent. In 27 of these little comedies Schwarz plays Little Moritz. Pathé Frères produced the first Little Moritz comedy in September 1911. In the Desmet Collection of EYE Filmmuseum, Amsterdam are several Little Moritz comedies, like Un déjeuner qui ne profite guère (1911), Les habits de little Moritz (1911), and Little Moritz épouse Rosalie/Little Moritz marries Rosalie (Romeo Bosetti, 1911) with Sarah Duhamel as Rosalie. EYE also has a few Little Moritz comedies in other collections. Sarah Duhamel had also her own Rosalie series at Pathé. She is hailed as the first female film comedian. With Maurice Schwartz as Little Moritz, she appeared in three films (according to IMDb in four). Little Moritz enlève Rosalie (Henri Gambart, 1911) focuses on the abduction of his beloved. Little Moritz demande Rosalie en mariage/Little Moritz asks Rosalie to marry him (Roméo Bosetti, 1911) is about the engagement of the love couple and Little Moritz épouse Rosalie/Little Moritz marries Rosalie (Roméo Bosetti, 1911) finally shows the complicated wedding of the couple. Maurice Schwarz appeared in some comedies as another character. In Les Escapades de Pépita/Pepita's Escapades (Henri Gambart, 1912), he played the young Andalusian girl Pepita more agile than beautiful - in drag. It was one of his last films. Word War I brought the production at Pathé Frères's Comica studio in Nice to an end. What later happened to Schwarz is not clear. Film posters for the films of Little Moritz can be seen at Fondation Seydoux-Pathé. Sources: Richard M. Roberts (SilentComedyMafia.com), Fondation Seydoux-Pathé (French), Wikipedia (German) and IMDb.